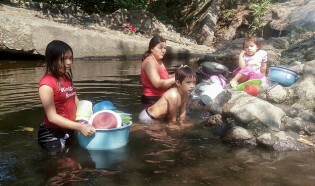 For nearly three decades, several communities in southeastern El Salvador have collectively and efficiently managed the water they consume, but monoculture production and climate change put their water at risk. Disconsolate, Alberto Flores piles up on the edge of a road the few bunches of plantains that he managed to save from a crop spoiled by heavy rains that completely flooded his farm in central El Salvador. Having a seven-litre container with a filter on the dining room table that purifies the collected rainwater, and opening a small valve to fill a cup and quench thirst, is almost revolutionry for Salvadoran peasant farmer Víctor de León. Eating healthy and nutritious food in schools in El Salvador is an effort that went from a pilot plan to a well-entrenched programme that has now taken off. Among the sea of names of victims of the Salvadoran civil war, engraved on a long black granite wall, Matilde Asencio managed to find the name of her son, Salvador. Except for a house with its walls riddled with holes made by bursts of machine gun fire, nobody would say that the quiet Salvadoran village of El Mozote was the scene of one of the worst massacres in Latin America, just 35 years ago. The Izcanal Radio and Television set is simple and austere, but this TV station made history in El Salvador, being the first, and until now the only one, to make the leap from community radio to community TV channel, in 2006. One word could undoubtedly summarize the past year with painful precision: Refugees. A basketball court in this small town in western El Salvador was turned overnight into a shelter for some two dozen families forced to flee their homes after a recent escalation of gang violence. Juana Morales is cooking one of the most popular dishes in El Salvador: pupusas, corn tortillas with different fillings. But hers are unique: they are not made with the traditional corn tortillas, but use Maya nuts, a highly nutritional seed that has fallen out of use but whose consumption is being encouraged in rural communities. The ruling of the highest court to repeal the amnesty law places El Salvador in the dilemma of deciding whether the country should prosecute those who committed serious violations to human rights during the civil war. El Salvador is debating reforms of the country’s privatised pension system, which could introduce changes so that it will no longer discriminate against women.